J. J. 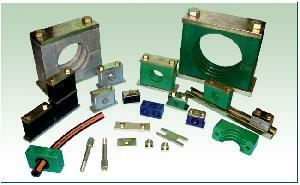 Pipe Clamps are manufactured as per DIN 3015 � Part 1, 2 & 3 for ease of interchangeability. DIN 3015 Fittings are available in different series � Standard series (Light Duty), Heavy Series & Twin Series. For best alignment of J.J. Pipe clamps it is recommended to mark their location on the support first. Then: Weld bottom plate on the support, push bottom half of clamp, install the pipe, mount top half of clamp and bolt unit together. To avoid damage to the plastic it is recommended that the plates to be welded before mounting the shell. Company Name: J. J. Hydraulics Pvt. Ltd.